Barry Jenkins made an unusual decision when he decided to write and direct a movie about three stages of one man’s life. Instead of a chronology, he has shown us how and why a young boy became who he is. The beauty of his film lies in the fact that every one of the actors understood the director’s unusual way of showing us what influenced his character. Though it is never explained explicitly, by the end, we understand. During the first third of the film we follow 10 year-old Chiron (Alex Hibbert) as he moves silently through school where he is bullied and nicknamed “Little.” At home his single mother pushes him out of the house while she entertains men as the boy sneaks off to various empty rundown places where he hides from trouble. He meets Juan (Mahershala Ali), a drug dealer with a heart, who takes the boy into his car and introduces him to his girlfriend Teresa (a very fine Janelle Monae). Throughout this first phase, Juan and Teresa are the only human beings who extend a hand to the boy who has nowhere to go or to live, has little to eat, eat and says almost nothing. For him, the mechanics of connecting have been crushed. Credit young Alex Hibbert whose deep, searching eyes create so much emotion for the audience. There are times during that first phase when we wonder about the long silences followed by little action. Where is this going? That’s when we begin to realize a tone is developing that gives us a deep look at the emptiness of the life of this silent young boy. Will he ever be able to transcend that void to discover who he is? All of this unfolds to a deeply affecting and original score. 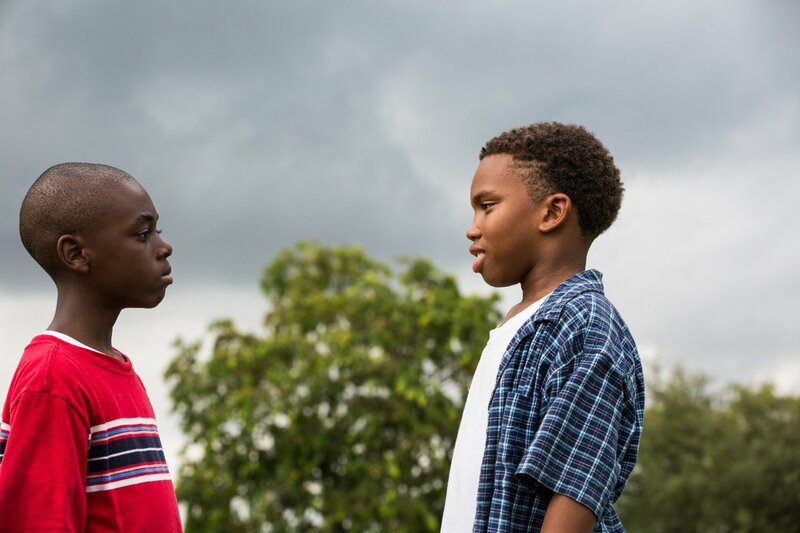 In Section Two, 16 year–old Chiron (Ashton Sanders) is beaten and taunted by classmates and worries about his sexuality. He is living the life of a mere survivor but summons the will to even some scores. As he moves to section 3, Chiron (Trevante Rhodes) is still dealing with both his sexual identity and innocence as he looks up Kevin (Jharrel Jerome) the only boy who had befriended him in school long ago. At 26, Chiron still says no more than a few words at a time. So little dialogue, so much feeling delivered on long walks, long rides, and much of it comes through a few nods or a glance. We remember what Juan told Chiron when he protected him at ten: “At some point you gotta decide who you gonna be.” From that age to 26, this young boy moves through life with little human connection and no support. There is no way to remain unaffected by the film Barry Jenkins has made. With a superb grasp of the director’s intentions, the actors and the composer of the score have created raw aloneness. Their gift to the audience is a beautiful tone poem. This review was posted on November 18, 2016, in Drama. Bookmark the permalink.